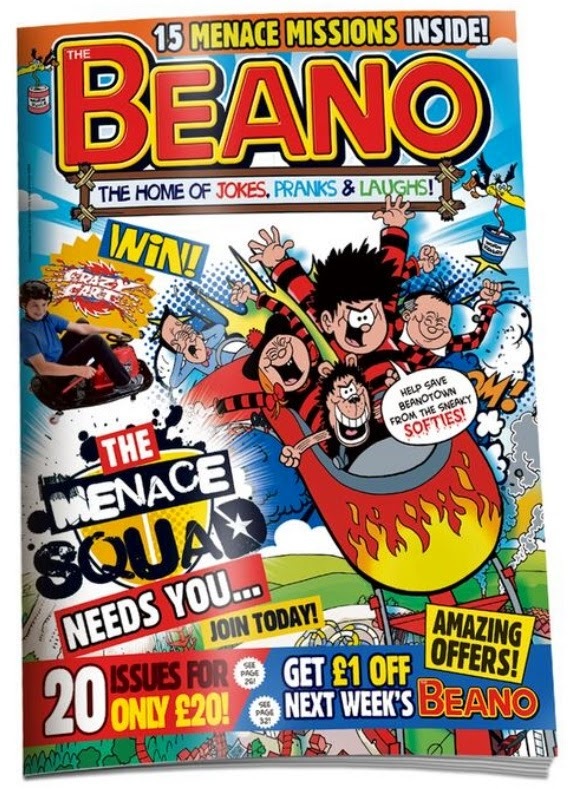 Bonfire Beano, plus Daily Mirror freebies! 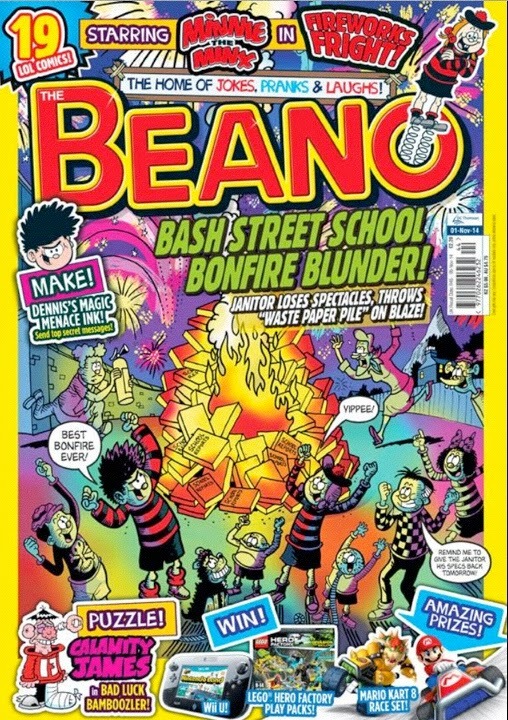 If you thought that the traditional 'fireworks issue' of children's comics was a thing of the past, check out the latest issue of The Beano. It features a fireworks-themed Minnie the Minx story drawn by Nigel Parkinson, and a great bonfire cover by him too. In the shops now! Speaking of that paper, this coming Saturday (November 1st) the Daily Mirror will contain a free special promotional edition of The Beano containing many of the regular strips in new stories. Never Be Without A Beano! 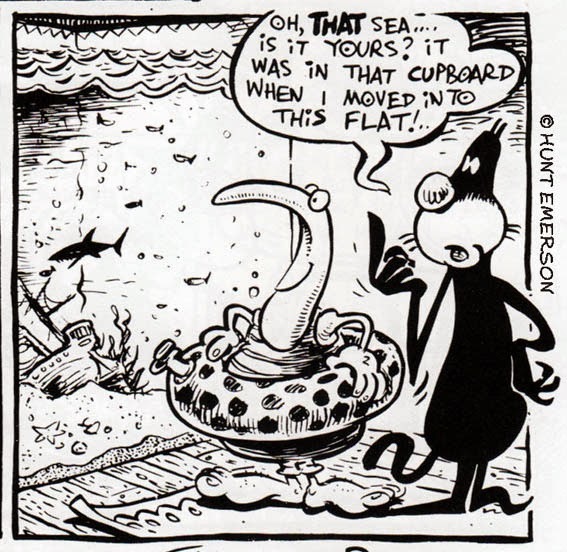 Published in time for the Lakes International Comic Art Festival last week was Hunt Emerson's Calculus Cat, a smartly produced A4 book consisting of 112 pages collecting all of his strips of the aforementioned moggy and new material to boot! The book was funded through Kickstarter, as I mentioned here back in June, and managed to reach its target of £10,000 thanks to 338 backers. The standard edition is in paperback, but those who pledged over £20 received a limited hardback edition. I've been a fan of Hunt's work since the 1970s when I first saw his strips in the underground comics produced by the Birmingham Arts Lab. His distinctively energetic, surreal, and genuinely funny work raises the spirits and is pure comics. 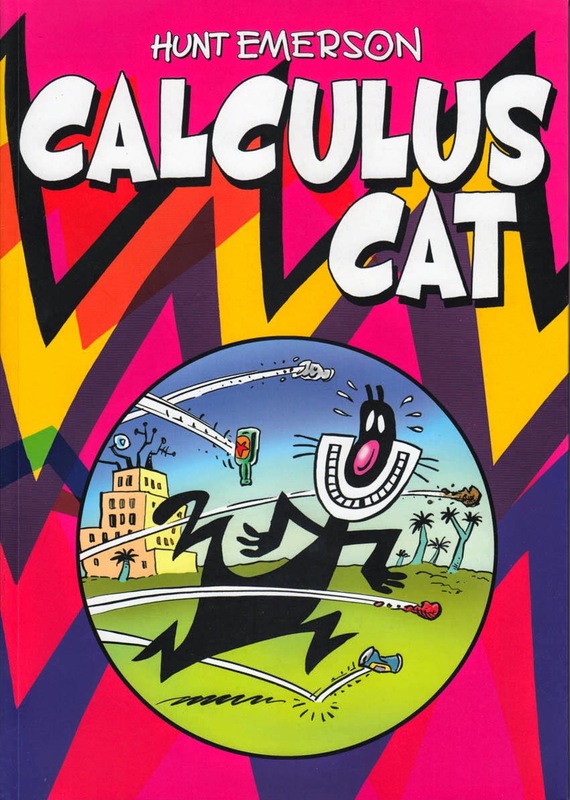 This collection of Calculus Cat strips, ranging back over 30 years and including brand new material, is a prime example of Hunt's best humour work. 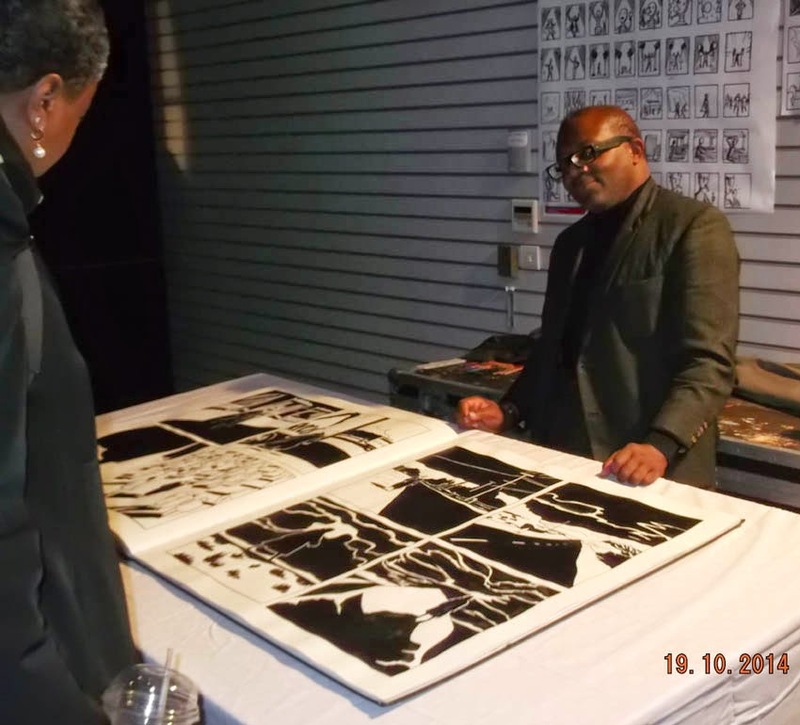 What is also evident is how Hunt has mastered the art of black and white comics. No colour is necessary; this is superbly balanced work. To add a bonus to the volume, Hunt invited a bunch of us comic types to contribute our own spin on Calculus Cat for a gallery section in the back of the book. My own humble effort is there and I'm proud to share pages with such great talents as Kevin O'Neill, Gilbert Shelton, Dave McKean, Graham Higgins, Roger Langridge, Phil Elliott, Kate Charlsworth, Steve Pugh and many more. Calculus Cat is published by Knockabout and is available to buy now. Even though I spend most of my time writing and drawing them, I very rarely dream about comics. 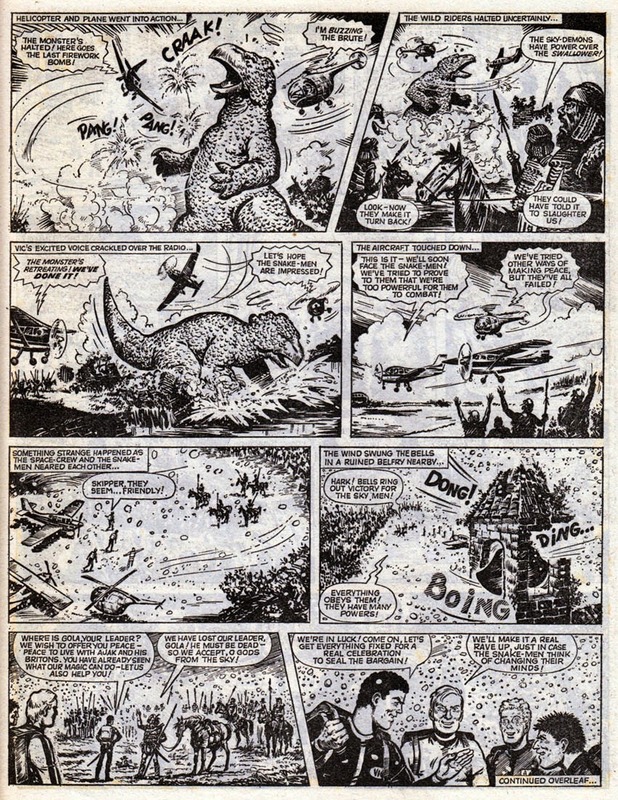 However there was one vivid dream a few years ago where I discovered that some cancelled comics of yesteryear were actually still being published and you'd find the latest editions if you rummaged deep enough into the displays in newsagents' shelves. That's sort of what happened in reality today when I found The Topper and The Hotspur in Sainsbury's. 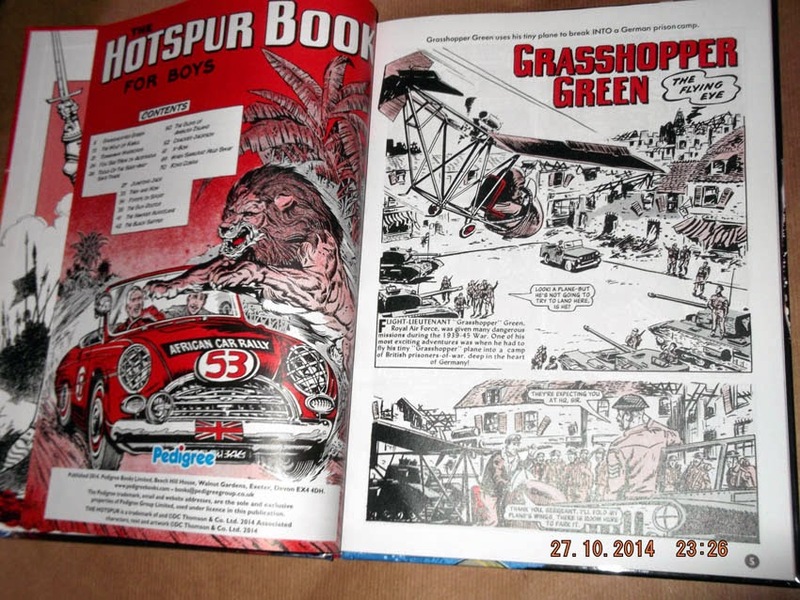 Well, strictly speaking it's The Best of The Topper Annual and The Best of The Hotspur Annual, two of the newly published reprint books I mentioned a while ago. 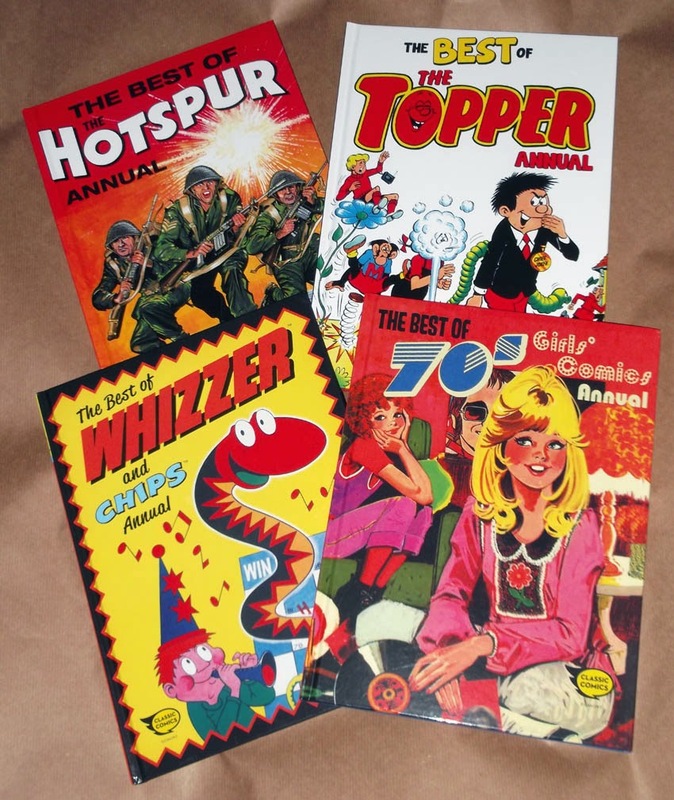 I'd recently acquired The Best of Whizzer and Chips Annual and The Best of 70s Girls' Comics Annual too, thanks to the kindness of someone who sent them to me. These books are all exclusive to Sainsbury's, and not every branch is stocking them. 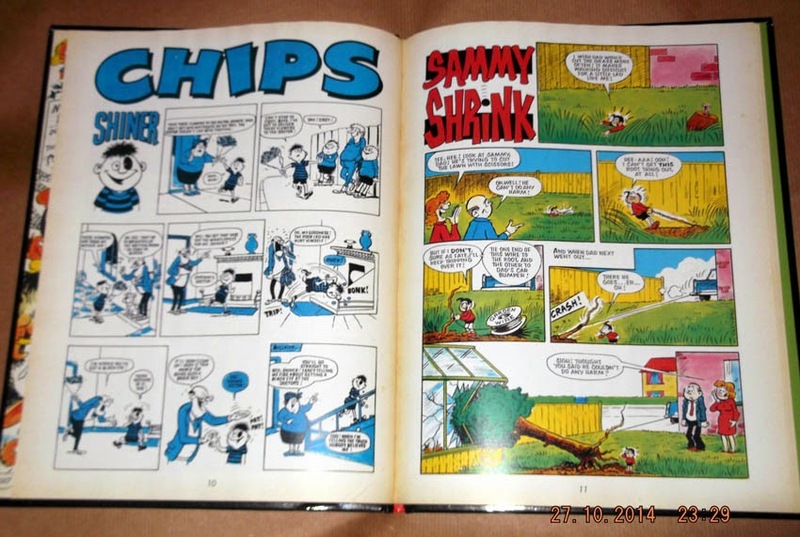 The DC Thomson books have 80 pages and the Egmont ones have 72 pages. Yep, they've lost weight over the years! 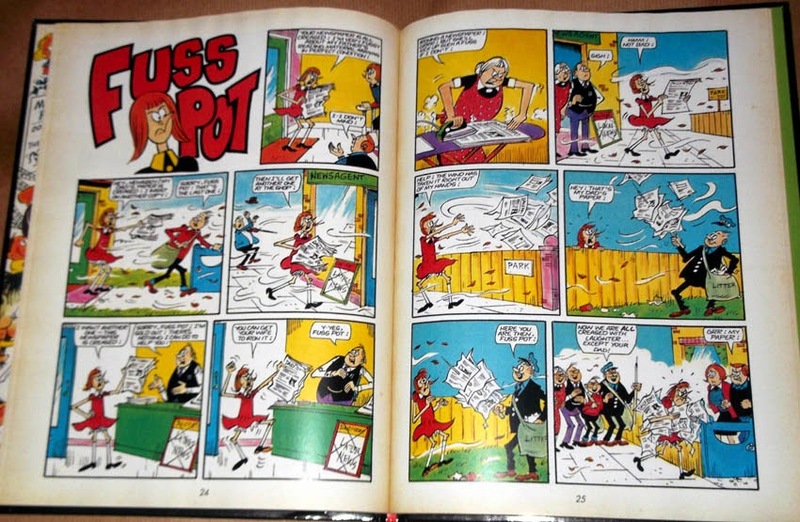 I think the DC Thomson books win in terms of print reproduction and reprint choices. The Best of The Topper Annual has some very nice 1960s and 1970s strips, including a Dudley Watkins Mickey the Monkey page and what looks like a Davey Law Beryl the Peril strip. All the old favourites are there including Figaro, Big Uggy, and The Whizzers from Ozz. There are some later strips too, such as Tricky Dicky, but I'd guess at least half of the material is from the sixties and early seventies. 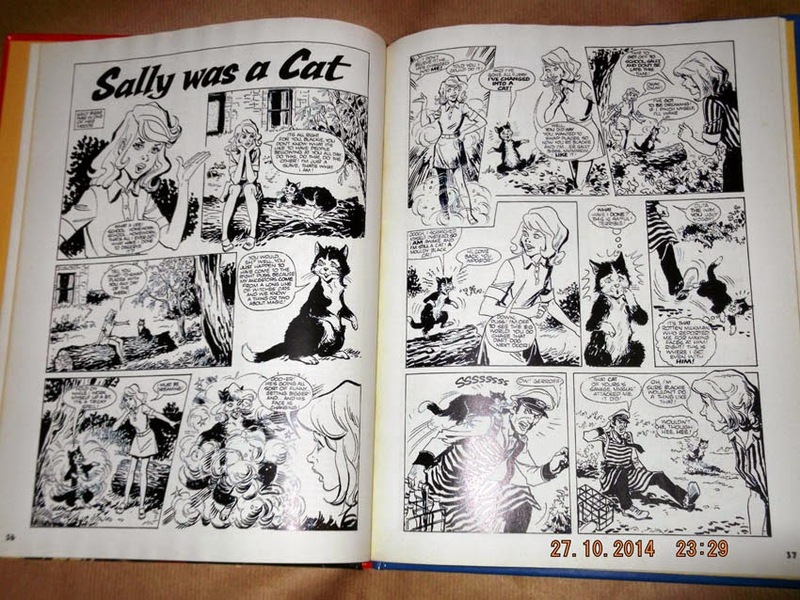 The Best of 70s Girls' Comics Annual has a selection of stories from Misty, Tammy, Jinty and Sally. The reproduction isn't as good as the Thomson books but everything is legible. There's a few features too, for nostalgic reasons. The Egmont books have chosen to add a 'tanning' effect to the edges of the pages to make them look aged but it's an unnecessary addition really. 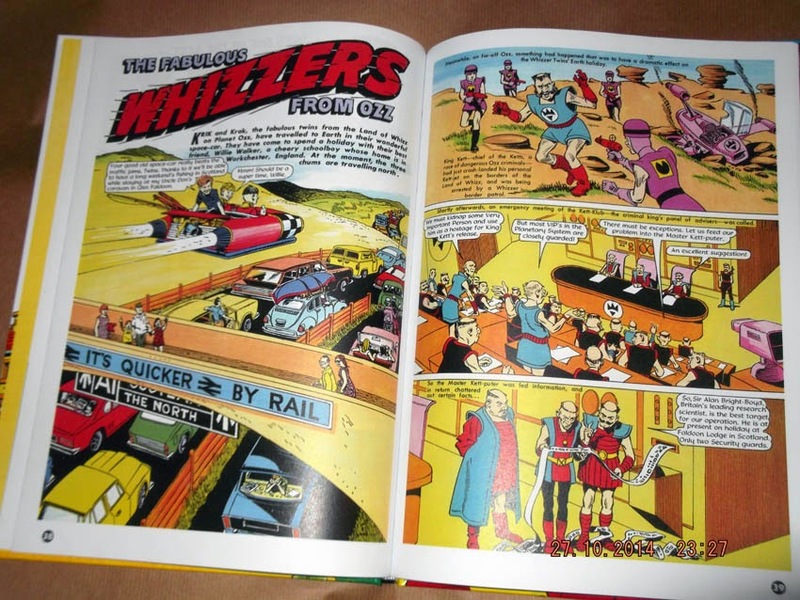 The Best of Whizzer and Chips Annual seems to be a random selection of strips. Some are reproduced better than others but overall they're sharp. 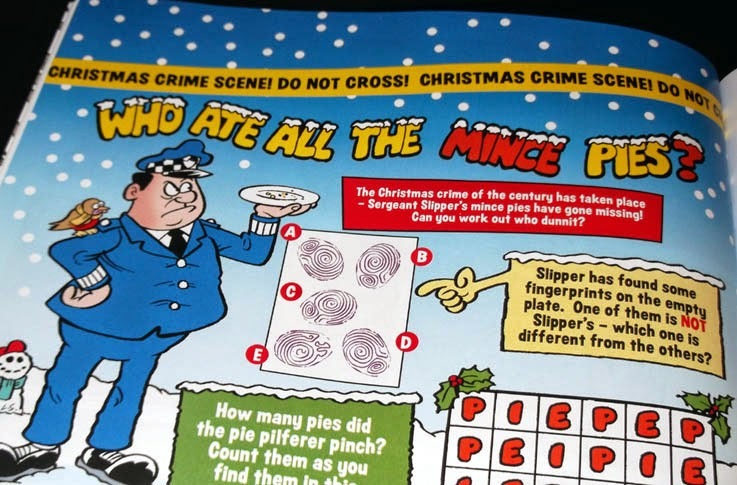 Oddly, even though the back cover declares 'Chips is inside', the book does not use the 'Two comics in one' gimmick but mixes up the strips instead. There's a Chips cover, but it's on page 10. Thing is, that 'two in one' gimmick never looked convincing in the annuals anyway (and who in their right mind would tear out the middle section of a book?) so perhaps Egmont felt it wouldn't work here, especially with a book that's only 72 pages. Still, it's a pity they didn't simply make the second half of the book a Chips section. 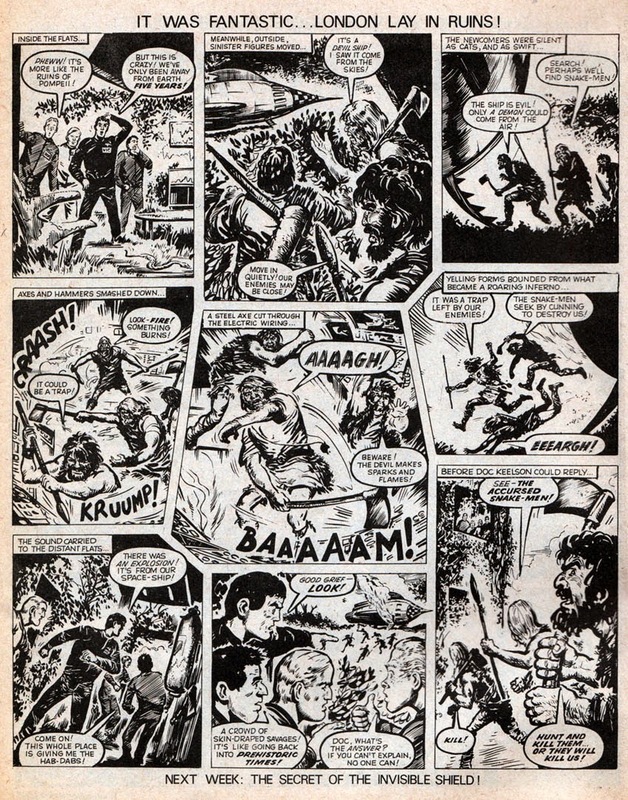 Tonight's episode of Doctor Who (In the Forest of the Night) reminded me in some ways of a short lived strip that ran in Lion weekly back in 1970/71, particularly the cover shown above (drawn by Geoff Campion). 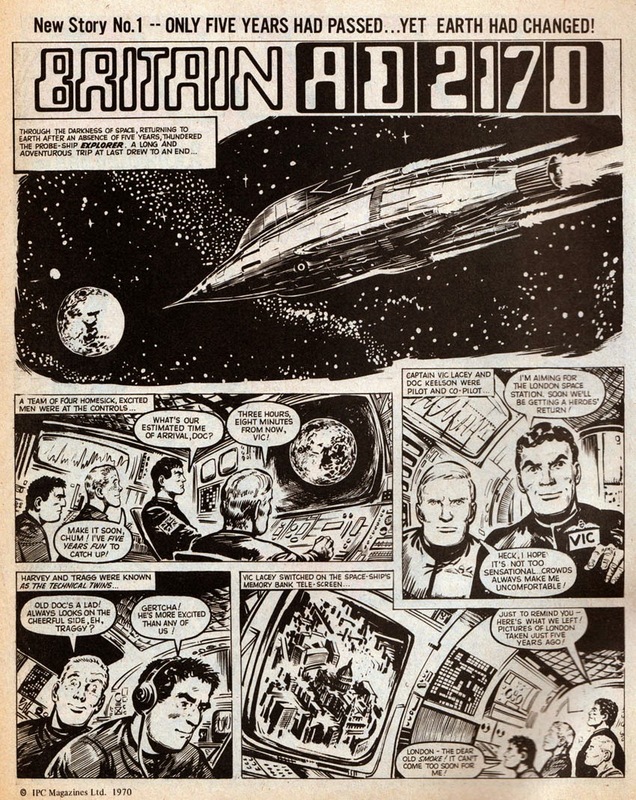 Britain AD2170 began in Lion dated 25th July 1970. 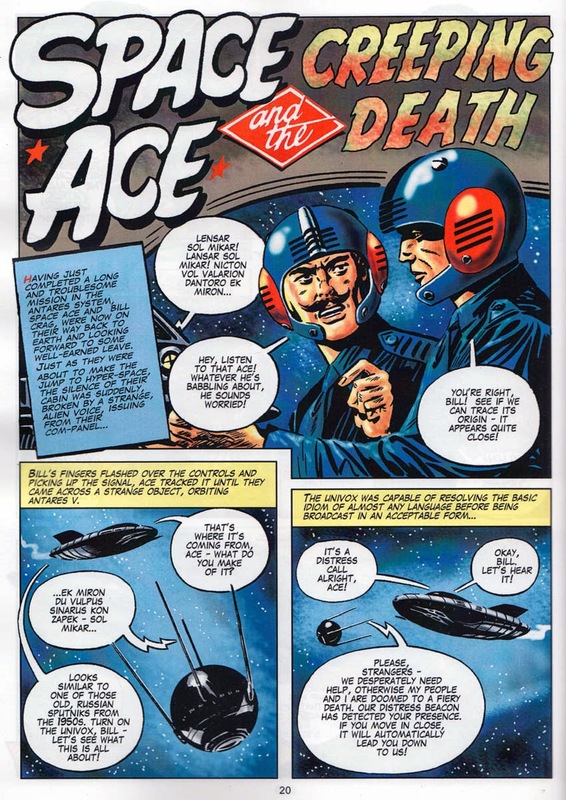 A three page serial illustrated by Solano Lopez (and possibly his studio assistants) it told the story of four British astronauts who return to Earth after a five year mission. They discover that Earth is covered in a dense jungle and people have reverted to a primitive state. Borrowing an explanation from Planet of the Apes, the story proposes that the ship must have travelled into the future and that they've actually arrived in the year 2170. 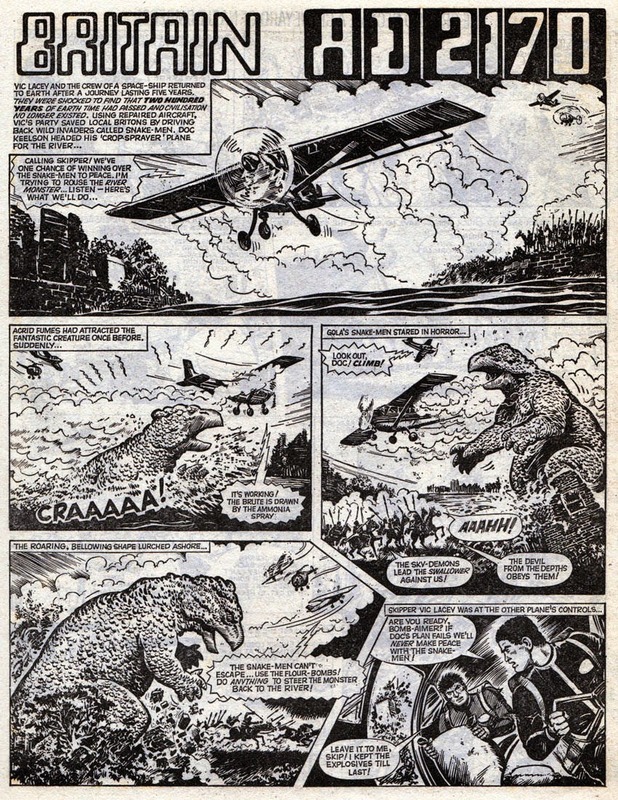 The astronauts use the remnants of civilisation to fight the Snakemen but there's a greater danger from a huge scaly Godzilla-like monster that roams London, although how and where it originated isn't really explained. 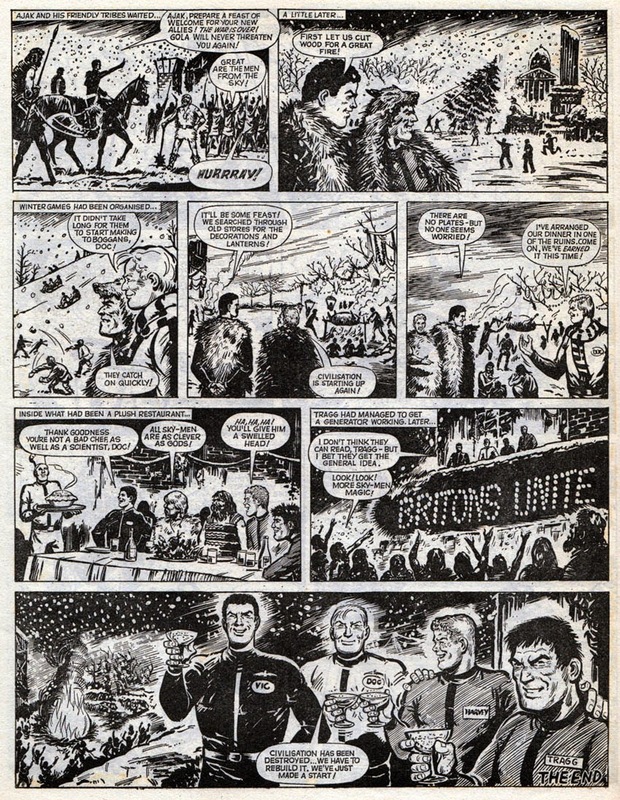 Britain AD2170 wasn't one of the greatest strips to have appeared in a British comic but it had its moments and was suitably exciting. 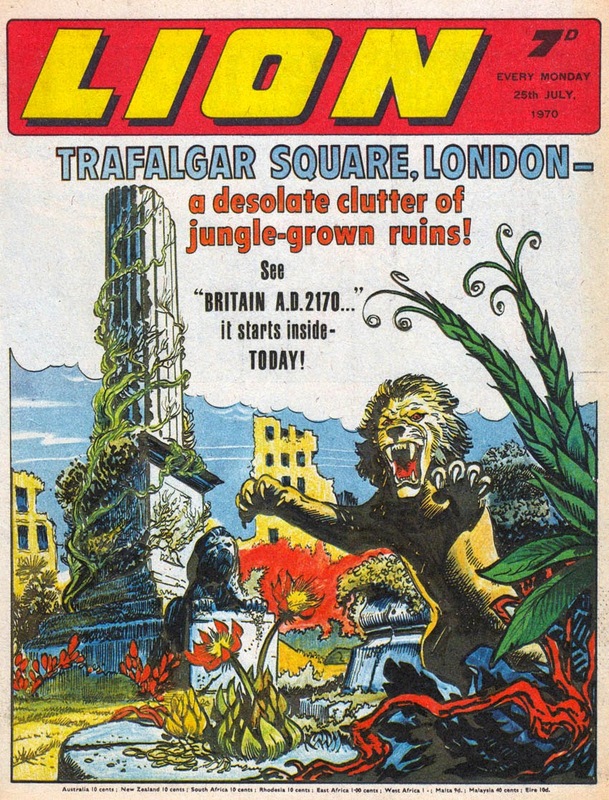 Personally I found Lion to be one of the better UK adventure comics of the seventies and was a good comic to lay the foundations for 2000AD a few years later. 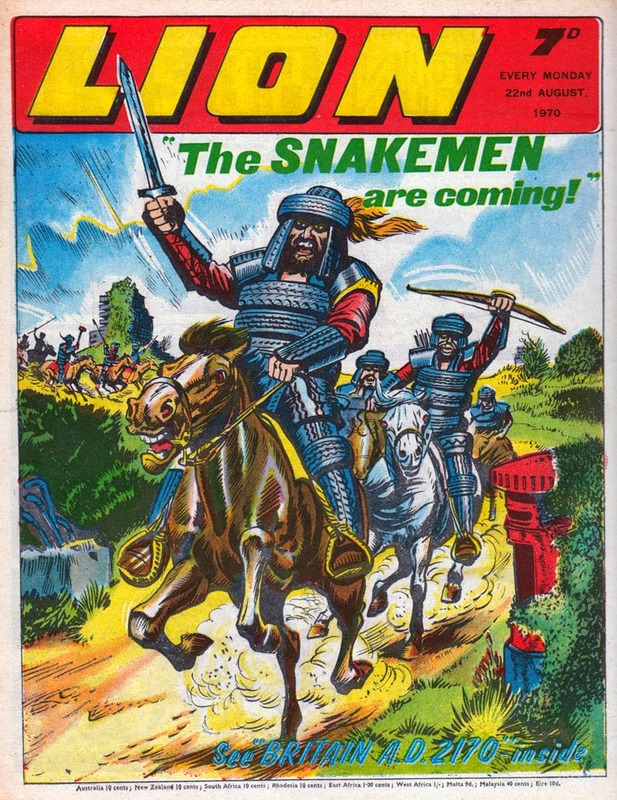 I'll be blogging more about Lion in future posts when I have time, hopefully before the year 2170. Commando 4751 to 4754, - out now! The 9th Century AD was a turbulent, violent time. Anglo-Saxon Britons had to fend off constant attacks from marauding and blood-thirsty Scandinavian warriors — the much-feared Vikings. Young Cadric was a Saxon — brave and willing to fight to defend his village from Viking hordes. As he did so, though, he had to face an equally deadly, but more sinister, enemy from closer to home. All occupied France went in fear and trembling of him — ruthless SS Colonel Ludwig Bauer — a monster in the guise of a man. Despite what Ken Barr’s magnificently menacing cover might make you think, this story isn’t all about the nefarious Colonel Scarface. It’s more the story of Lieutenant Rick Matthews, Commando. What’s more, it’s also a French Resistance story, a type that’s very difficult to make successful as there’s often not a lot of action to play with. The script neatly avoids tense, cliff-hanging moments by being filled with the crash and thunder of battle. All very well drafted by Gonzales. Lastly, watch out for the comedy moment on page 55. You have been warned. After firmly putting a bully in his place with a well-aimed punch, young Thomas Markham knew he had to make himself difficult to find. He was helped by Sergeant Ned Royle who suggested joining the Royal Marines and losing himself there. 2014 is a truly momentous year for the Royal Marines as on the 28th October we mark our 350th birthday, completing three and a half centuries of unbroken service, committed, as an integral part of the Naval Service, to protecting and promoting the United Kingdom’s security, prosperity and reputation, both and home and overseas; truly 350 years of Timeless Distinction. Formed in 1664 as the Duke of York and Albany’s Maritime Regiment of Foot, the Royal Marines, the modern Royal Navy’s “go anywhere force”, have evolved into the United Kingdom’s commando forces, held at high readiness and trained to operate anywhere in the World and carry out the full spectrum of operations, be that peacekeeping, disaster relief, military training/advisory teams, specialist amphibious operations and high intensity combat. 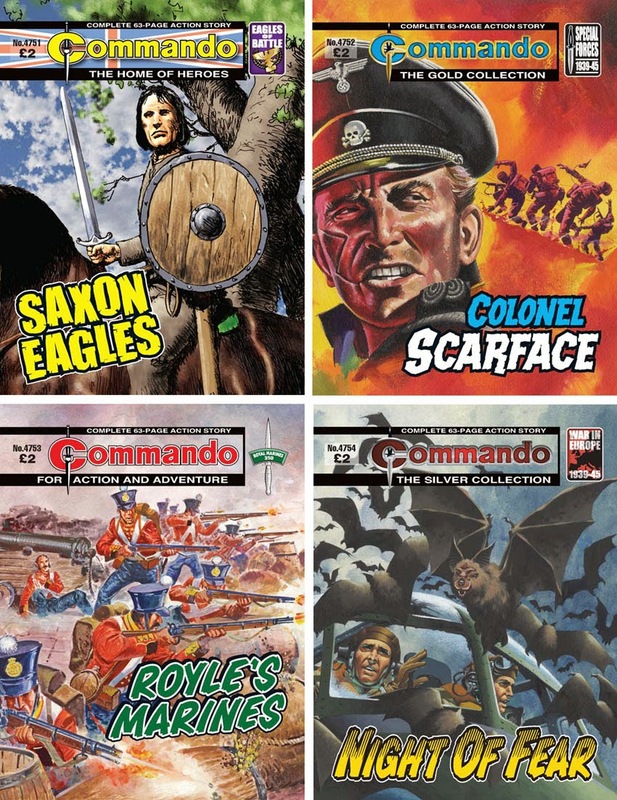 Now, whilst the stories contained in the Commando Comics are obviously fiction, there are numerous common values shared between the characters, the Corps today, and our illustrious forebears who have served the Corps and the Crown so well since 1664. The Royal Marines Ethos is based on characteristics of courage, determination, cheerfulness in adversity and selflessness and they have stayed true throughout our 350 year history and have enabled the Royal Marines to be involved in virtually every one of the United Kingdom’s conflicts, and notably to have seen active service every year since the outbreak of World War II to the present day, with the sole exception of 1968. Today’s Royal Marines remain at the forefront of the United Kingdom’s crisis response force and are a key component of the Government’s conflict prevention agenda. Through our World-renowned brand of understated professionalism we hope to remain there for another 350 years and more. Transylvania — an eerie land of legends, of werewolves and vampires, of hauntings and spine-chilling screams in the dark. Not the most welcoming place in the world to crash-land in at dead of night — especially when your Mosquito has been damaged, not by Nazi flak…but by a swarm of thousands of large, black bats! Night of Fear may not be the most subtle Commando ever published — but it is certainly a hugely entertaining one. The influences on the plot — Hollywood vampire movies and American horror comics — are actually acknowledged in the text, so, nearly 40 years on this remains a fiendishly fun read. In my humble opinion, this is definitely a treat. Happy Halloween! The Brewery Arts Centre, Kendal. 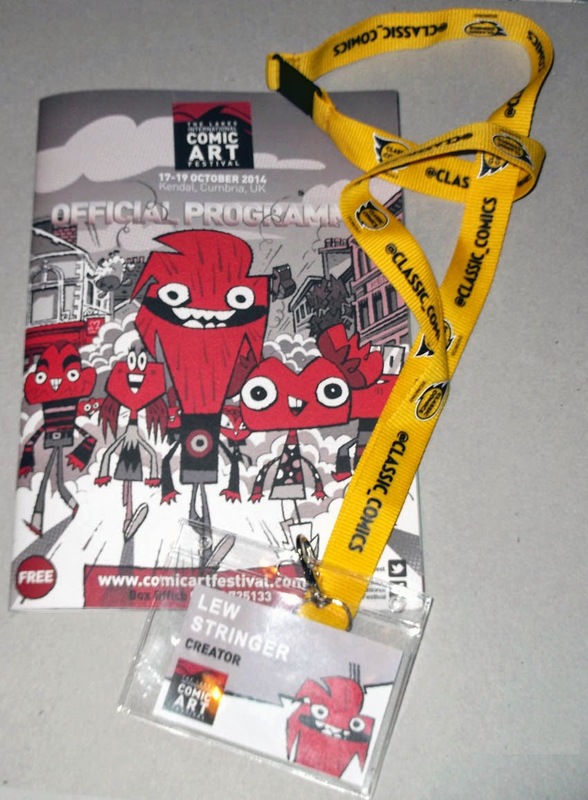 Having been away from the convention circuit for a couple of years for various reasons I started doing a few shows this year to get back into the swing of things and I really enjoyed attending The Lakes International Comic Art Festival last weekend (17th to 19th October). I didn't make it to last year's event but I'd heard only positive things about it, and this year's festival certainly lived up to that. As one of the guests I'd been sent a lot of useful information from the organisers which helped a great deal. 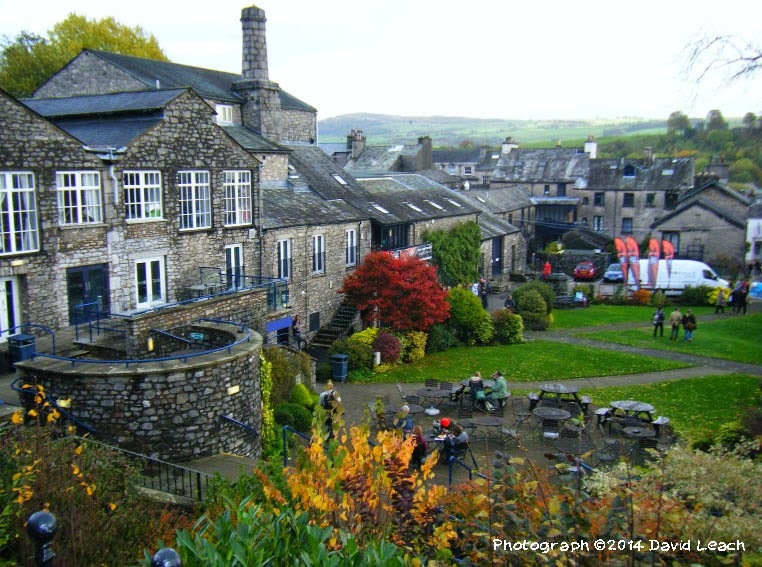 When I arrived in Kendal I made my way to the liaison point, where Guests Co-ordinator Sandra Wood greeted me and organised a lift to my guest house. I was pleased to see that my old pal Mike Collins (now storyboard artist on Doctor Who) was staying at the same digs and the guest house was very friendly and comfortable. That evening Mike and I walked into town for the complimentary Festival meal at the Brewery Arts Centre, meeting up with other comics guests such as Panini UK editor/writer Scott Gray and John Freeman (also an editor and writer) who runs British comics news site Down the Tubes. After which we went to see John interview Dez Skinn at the library on his creation of Doctor Who Weekly (which was celebrating its 35th anniversary that week). Strangehaven's Gary Millidge being camera shy. 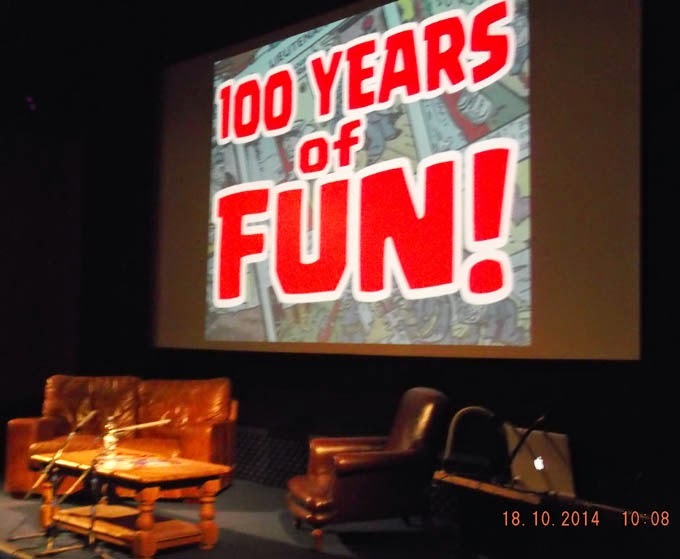 Unlike most other UK comics shows which are confined to one building, the town itself was involved with the festival and the events took place in several venues throughout Kendal. 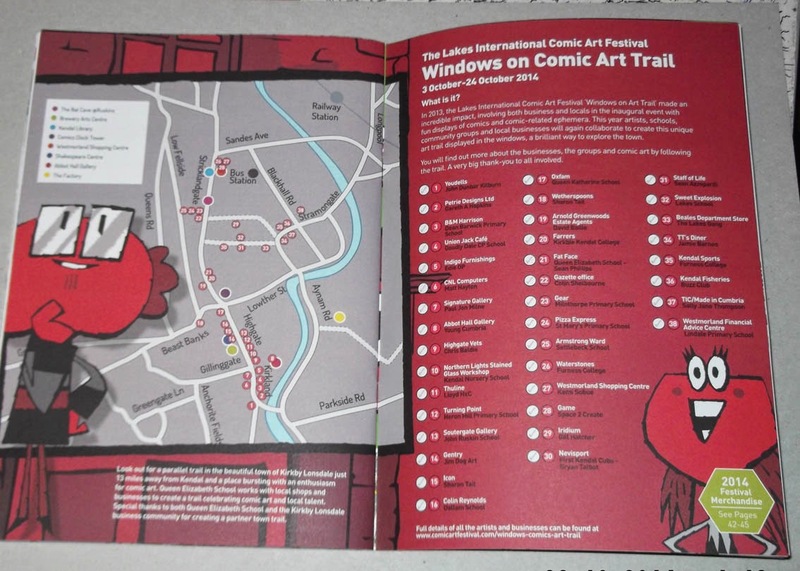 Also, the 'Windows on Comic Art Trail' had displays in windows of local businesses in the town centre, and banners for the festival draped across the street. As most comics folk work from home, often in isolation, we always enjoy a get-together at such events. Therefore it was no surprise to find most attendees ending up back at the Brewery Arts Centre bar in the evenings. Over the weekend it was great to catch up with David Leach, Gary Erskine, Davey Jones, Woodrow Phoenix, Debbie Tate, Robbie Morrison, Dave Gibbons, Jessica Martin, Kev F. Sutherland, John McShane, Gary Millidge, John Short, Doug and Sue Braithwaite, Gary Northfield and many others, including Eddie Campbell and Frank Plowright who I hadn't seen for many years. Good to put faces to names too, by meeting people such as Russell Willis and Jeremy Briggs. The audience were let in, Hunt Emerson introduced me, and I was off. Off to a bit of a croaky start unfortunately as some dust irritated my throat but that was soon sorted and the presentation went ok I think. We'd called it 100 Years of Fun but in actuality I covered over 140 years in 60 minutes. 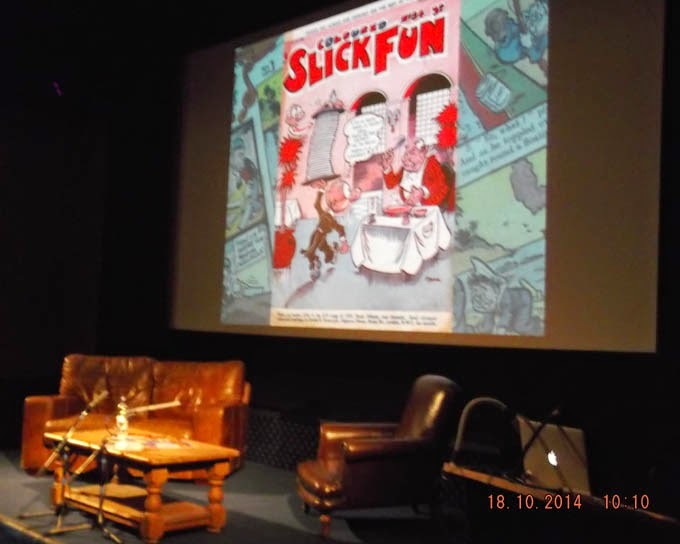 A bit of a whirlwind journey through time, I started with the 19th Century titles The Glasgow Looking Glass and Funny Folks and ended on a positive note with today's comics including Joe Matthew's new one, Funny Monsters. I don't know how well I did compared to previous historians such as Denis Gifford and before him Barry Ono, but I hope people enjoyed it. Nigel Parkinson and his colourist Nika were in the audience so it was excellent to meet up with them afterwards and have a slap up feed at the local chip shop whilst talking comics. 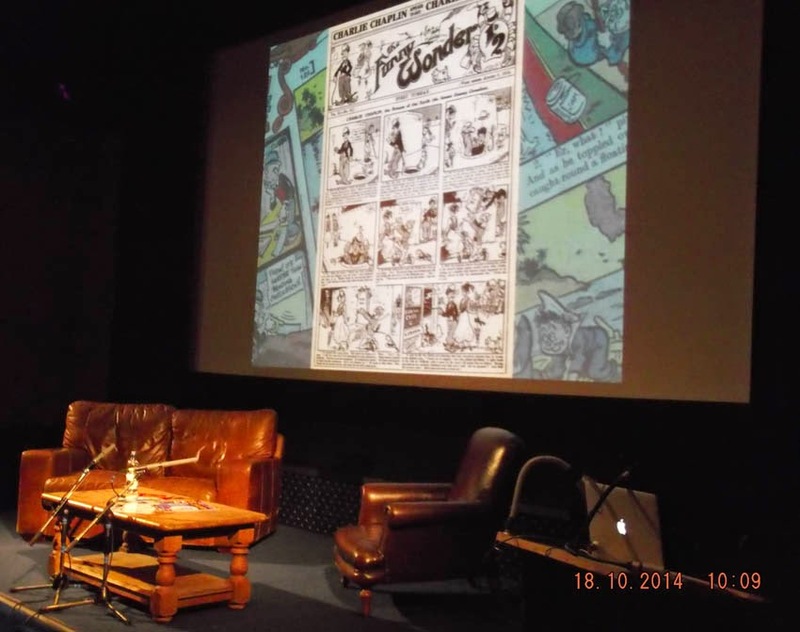 Later in the afternoon my next gig was the Cowboy Henk vs Combat Colin 'live draw shoot-out'. 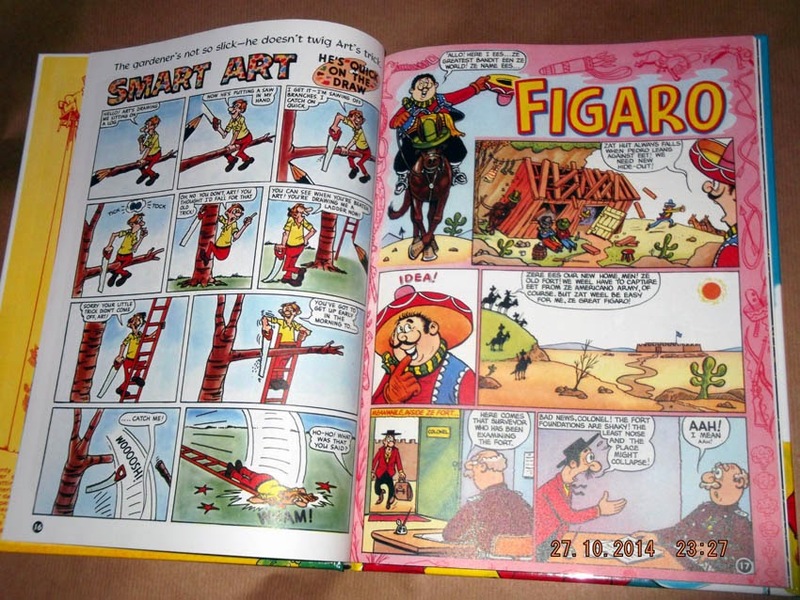 Cowboy Henk being the creation of Flemish artist Herr Seele. As we were setting up it was good to finally meet Festival Director Julie Tait, as we'd previously only communicated by e-mail. 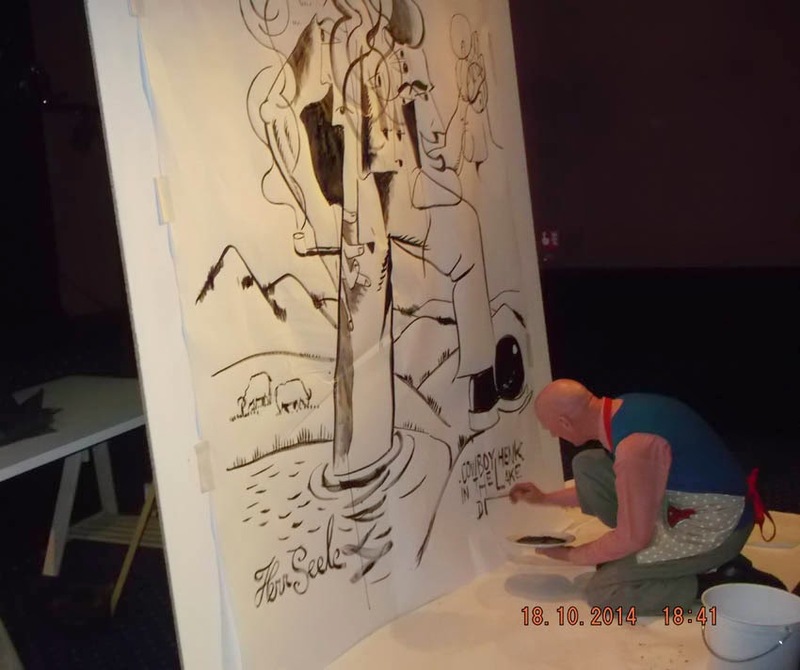 Usually at these 'live draw shoot-outs' two artists have a friendly competition, drawing at desks as their work is projected on screen for the audience to see. Herr Seele, who is an extroverted but very interesting character, instead chose to start with a power point presentation of his work. I didn't mind this at all as it was fascinating to learn about his history and the development of his popular Cowboy Henk character. With the presentation over, Herr Seele (real name Peter van Heirseele) set to work painting a huge cubist image of Cowboy Henk while I drew characters projected onto the screen. Hunt Emerson was interviewing both of us as we worked. Probably the most surreal event I've done at a comics show but I enjoyed it and I think the audience did too. Afterwards I did a quick sketching/signing session. There were a lot of events going on over the weekend, giving visitors plenty of choice. There were talks and presentations by people such as Dave Gibbons, Joost Swarte, Rian Hughes, Sean Phillips, Gail Simone, Charlie Adlard, Audrey Niffenegger, Becky Cloonan, Mark Buckingham, Bryan Talbot, Jeff Smith, Metaphrog, Emma Vieceli and others, plus exhibitions, dealers rooms, workshops, and more. The great thing was the diversity of comics, and the fact that this was entirely a comics-focused event, not part of a multi-media show. (Hardly any cosplayers too.) I'm sure that many curious members of the public who drifted into the Comics Clock Tower must have learned at least a little more about comics during the weekend, and that can only be a good thing. The superbly designed 52 page programme. I was hugely impressed with the professionalism of the festival and the warm, friendly enthusiasm of the very helpful festival team. If there were any hiccoughs in the running of the event it certainly didn't show as far as I was aware. My thanks to Julie Tait, Sandra Wood, Jenny Graham and the whole team for a very enjoyable weekend indeed. 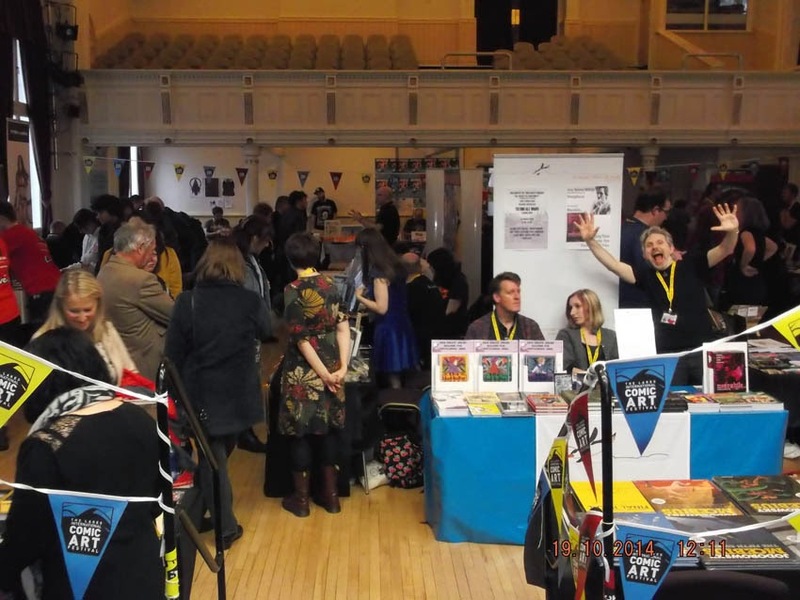 The Lakes International Comic Art Festival has a positive and invigorating vibe about it, proving that comics in the UK are far from dead, and that they now appeal to a wider cross-section of people than ever before. 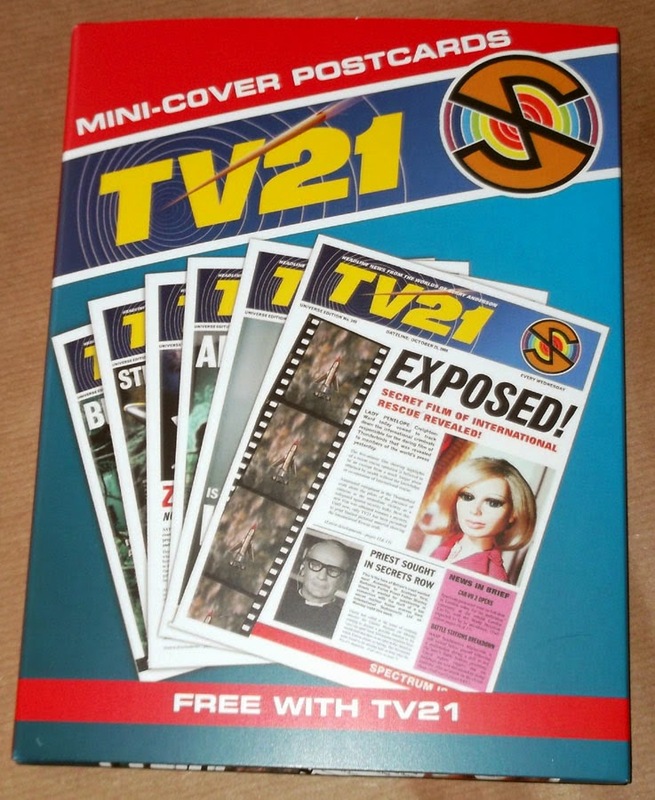 The brand new issue of TV21 turned up today, just as it used to on a Wednesday back in the 1960s. Colonel White is back in charge of the letters page and all the strips begin new adventures. 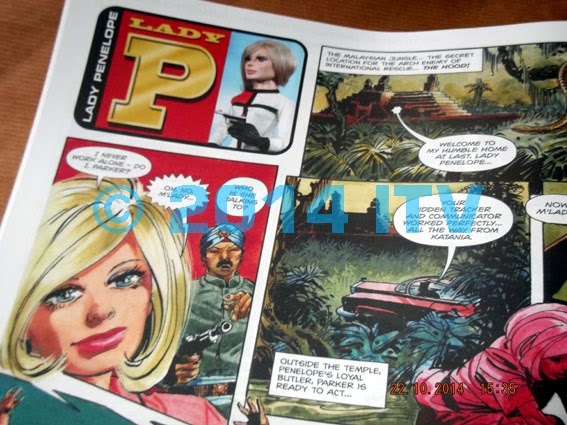 John Burns' Lady Penelope is particularly exciting, and it's good to see Gerry Embleton drawing Stingray. 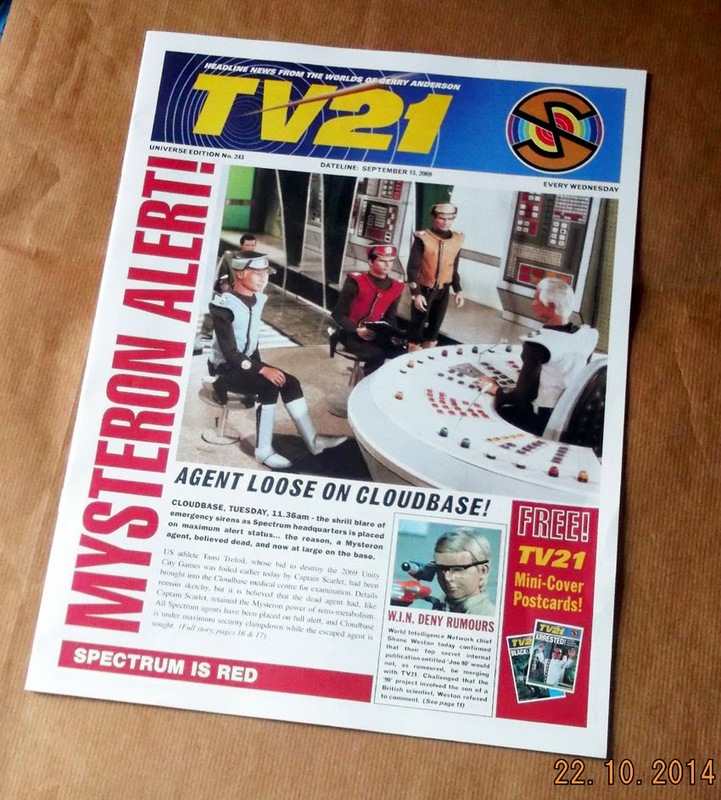 In case you hadn't already read my earlier blogs on the subject, this issue of TV21 is a special one-off edition that is part of the package of goodies within the Supermarionation box set. 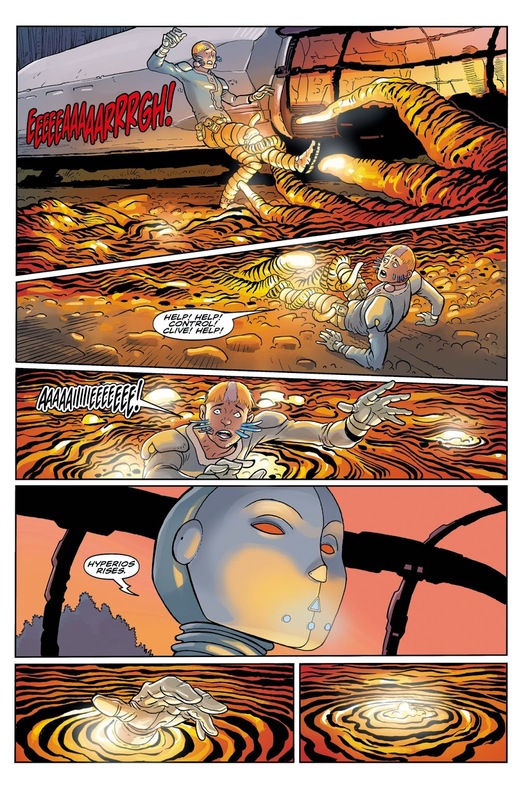 The concept of this comic is that it's issue No.243 of TV21, dated September 13th 2069, - the issue that one imagines might have been published in 1969 had Joe 90 comic not merged into its pages. An issue of TV21 from an alternate reality if you like! The Brains behind this brilliant idea is editor Martin Cater of Network, the company responsible for the excellent box set. 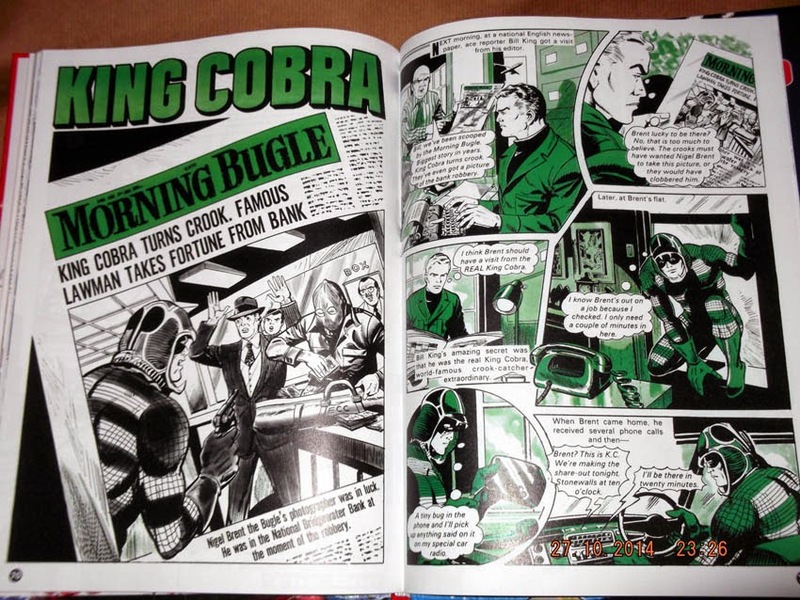 Assembling a team of comic creators he has constructed a 24 page comic that perfectly echoes the TV21 of yesteryear. It's even the exact size of those early editions and carries the same story logos that were designed in the 1960s. The content though is all-new! 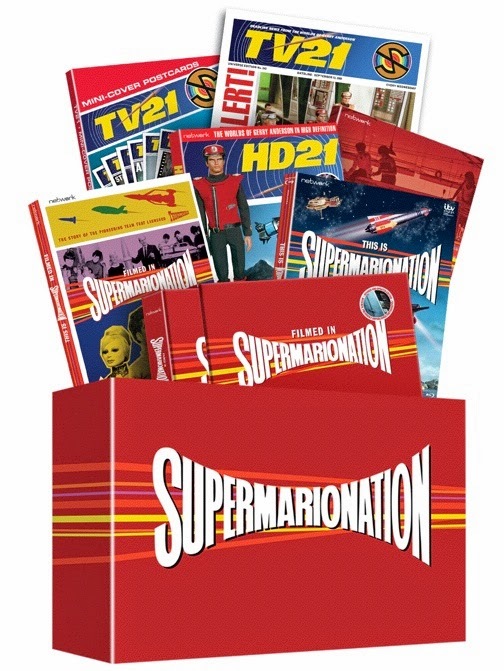 The strips include all the Gerry Anderson shows produced in the 1960s, so in addition to Supercar, Fireball XL5, Stingray, Thunderbirds, and Captain Scarlet plus Zero X we also have Joe 90 (who never appeared in the first series of TV21 until the relaunched merger with his own comic) and The Secret Service (which never previously appeared in TV21 at all). There's also a pitch perfect Agent 21 strip by Brian Williamson and a Zoony the Lazoon strip by myself, plus a Project Sword prose story. Graham Bleathman is also on board with a new cutaway of the Mars Space Probe. 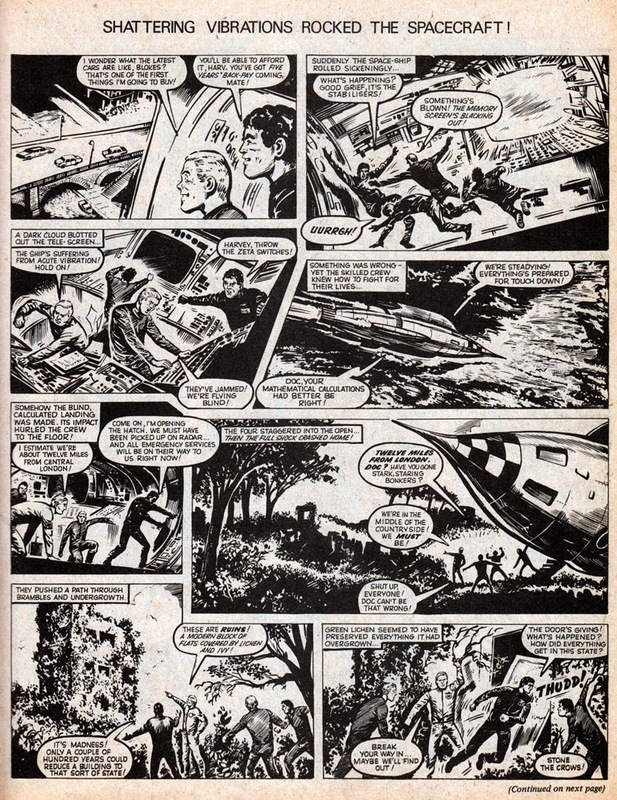 It's good to see my old friends Mike Collins and Bambos contributing good stuff, and Antonio Barreti's Secret Service is a spot-on sixties homage, but I'm sure they'll forgive me when I say the highlight for me was the centrespread strip, - Lady Penelope by John Burns! The veteran artist is still a master of his craft and these pages look so authentically 1960s that for a moment I felt I was back in that decade. Rest assured though that this is definitely brand new material! 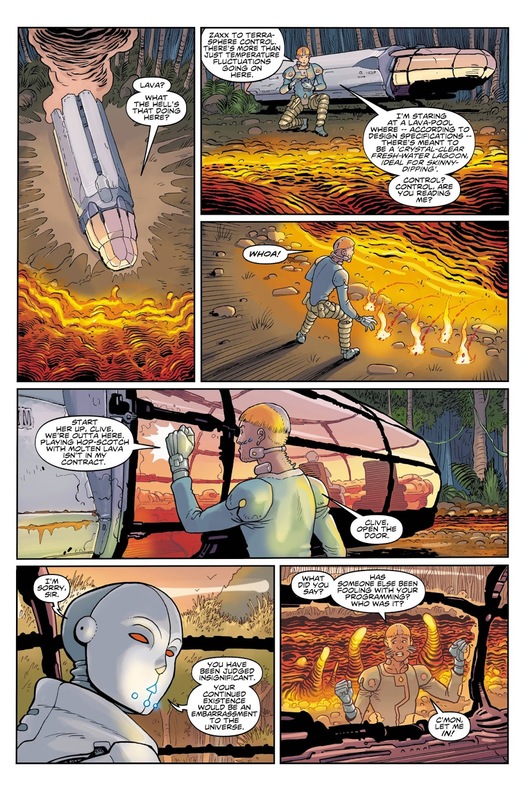 John Burns isn't the only veteran artist involved, as Martin Asbury has contributed a two page Captain Scarlet strip and Gerry Embleton is back at the helm of Stingray! Embleton's style may be a little looser than it was but the skill is as sharp as ever. This is good stuff! 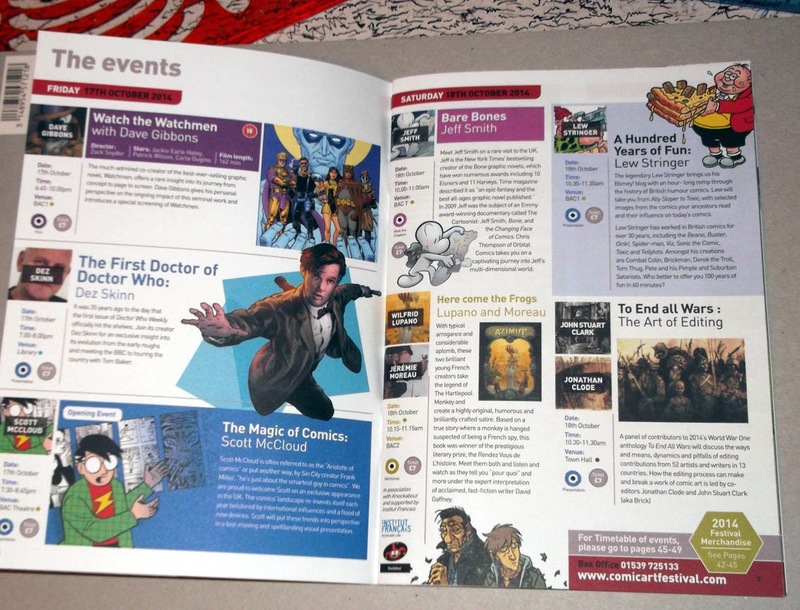 The comic even comes with a free gift in the form of six postcards of TV21 covers for the following few issues! Sadly those issues do not actually exist, but wouldn't it be great if they did? 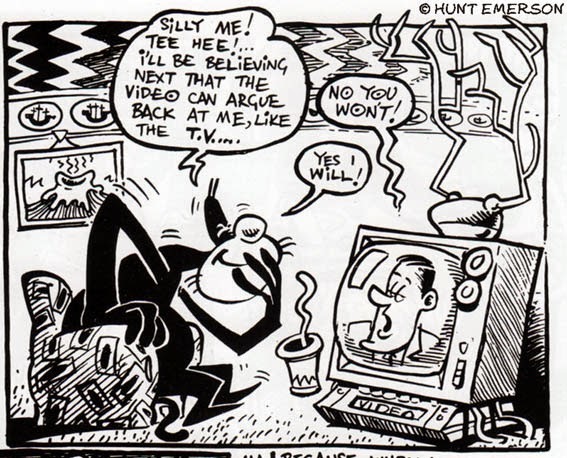 It's been an absolute pleasure to contribute to the history of TV21, - my favourite adventure comic of my childhood, and certainly my favourite comic of this year! For one day, the brighter, optimistic 21st Century is with us once again. Christmas comes early to Beanotown! 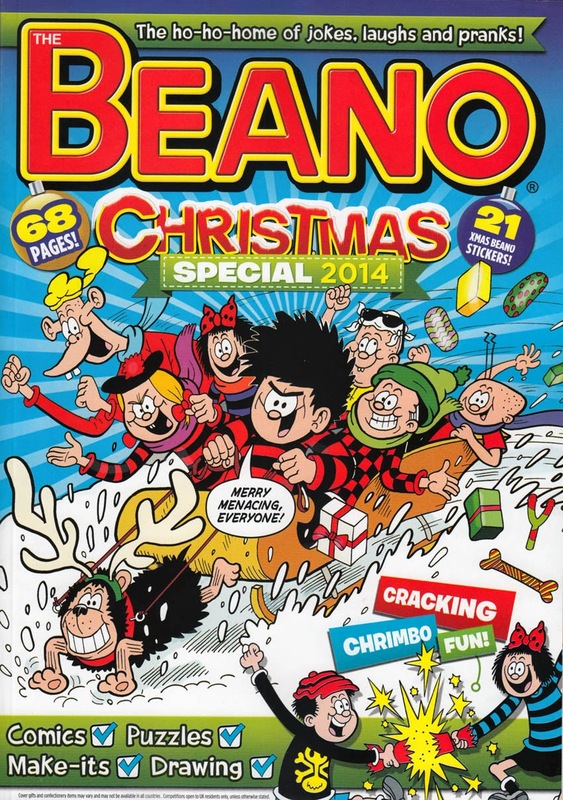 The Summer Specials are still in the shops but now there's also The Beano Christmas Special No.1 alongside them! The 64 page squarebound comic features a mixture of brand new material and reprint, plus various puzzles and activity features. It also contains a sheet of 21 free stickers. All the reprints are relatively contemporary; Tom Paterson Minnie the Minx and suchlike. No classic 1950s-70s material. This is a bright, fun, stocking stuffer, not a trip down memory lane. Well worth it though for Beano fans! 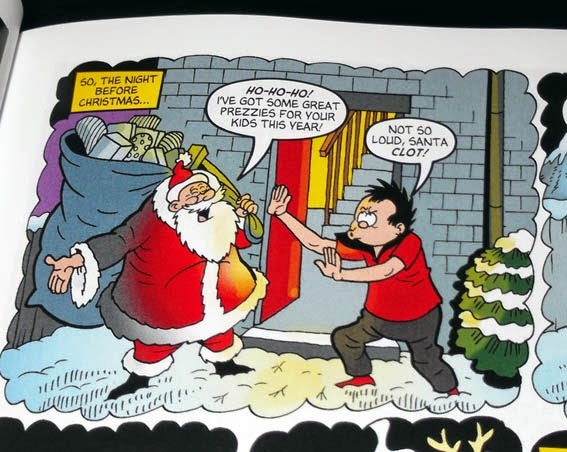 The Beano Christmas Special 2014 is out now, priced £4.99. Remember I mentioned that I was working on strips for a U.S. publisher? This is the comic. Alex de Campi's Grindhouse returns for a new 8 issue run next month, and I'm over the moon to announce that Alex commissioned me to produce single-page humour strips as back up funnies for some of the issues. Grindhouse: Drive In, Bleed Out is an eight issue series published by Dark Horse Comics which will feature four two-part stories across the run. 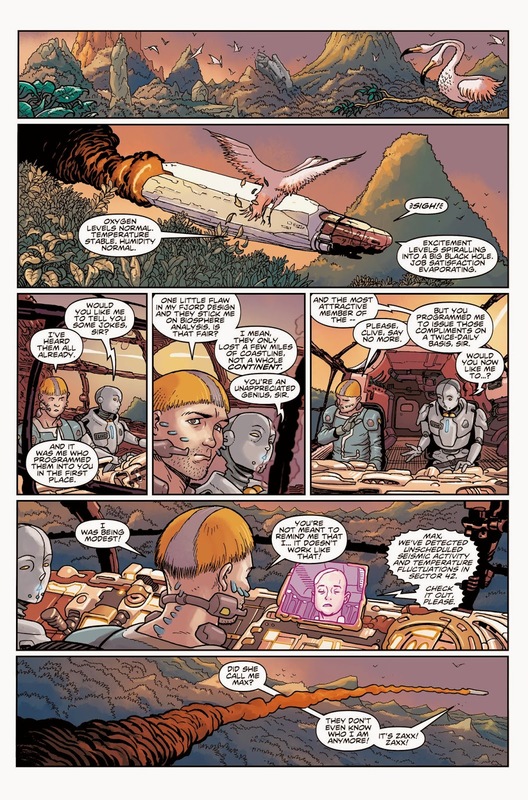 No.1 features Slay Ride written by Alex de Campi and illustrated by R.M. Guéra. On her website, Alex describes says "It gets down to business really fast. This is a very brutal, uncomfortable, and spare / silent story"
...and on the back page will be my humour strip as part of the Li'l House of Grind concept that Alex came up with. My brief was for something like the old trashy grindhouse horror/exploitation movies. The result: Kung-Fu Cheesecake, with script, art, lettering by myself. I've been commissioned to produce four single page complete strips for the comic, which will appear in issues 1,2,7 and 8. Brand new twisted characters for a mature readership. 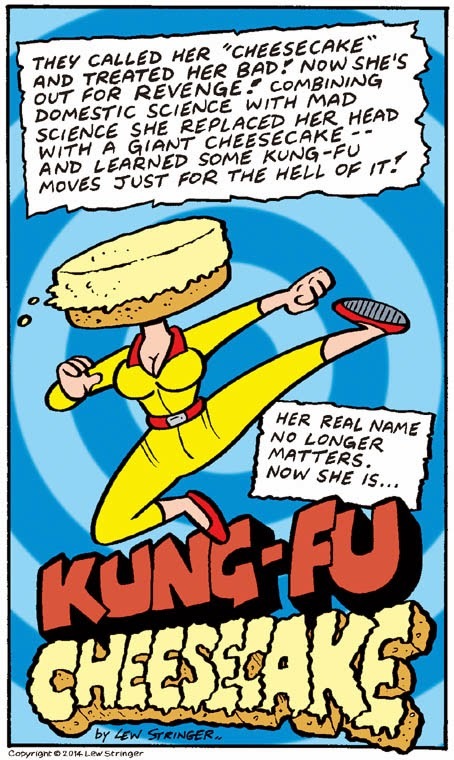 Kung-Fu Cheesecake is one of the weirdest characters I've created. I'm drawing the page for issue 2 this week which features another new comic-horror creation. Really enjoying this! 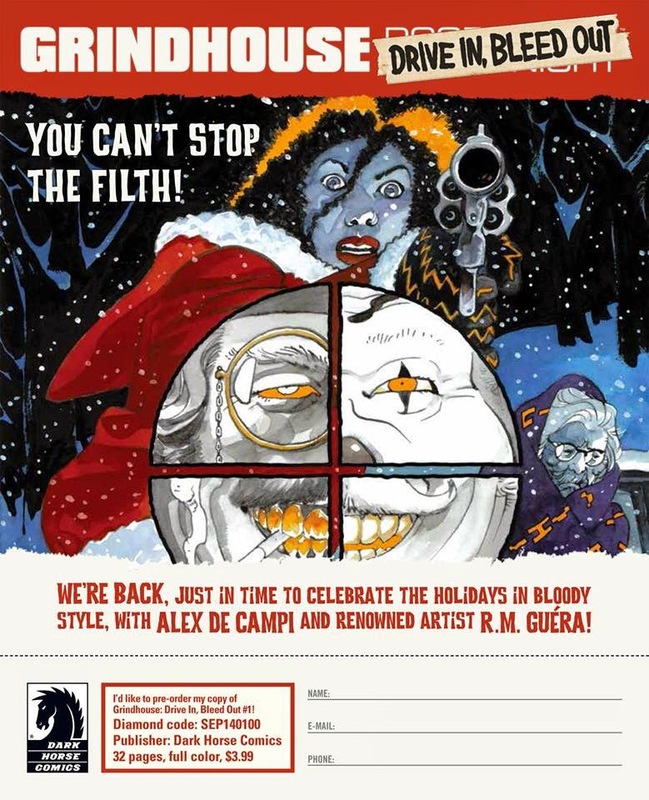 Grindhouse: Drive In, Bleed Out No.1 is scheduled for publication on Wednesday November 12th, priced $3.99. Available in comic stores in the USA and UK but to make sure of your copy, place an order today! Mature Readers rating. John Lawrence, longtime fan of the late artist Ron Turner, has published another collection of classic 1950s strips by the illustrator. 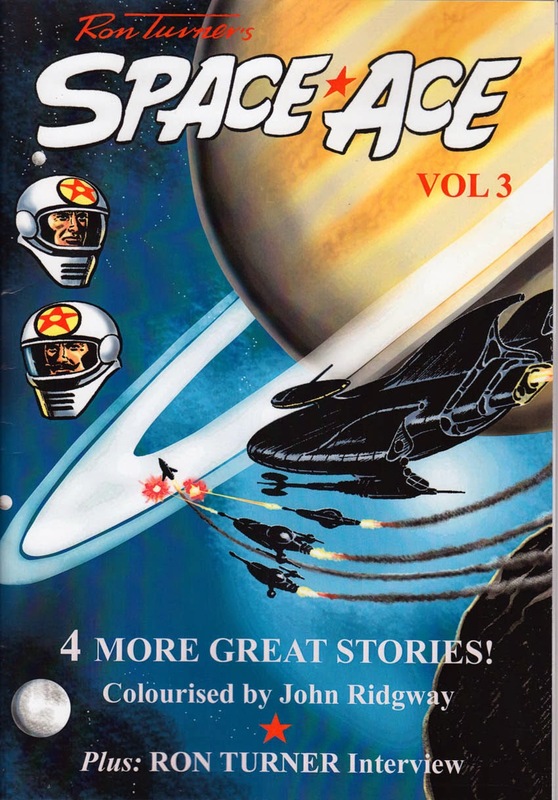 Ron Turner's Space Ace Volume 3 is an A4 sized 40 page softback book featuring four complete stories featuring the comics character Space Ace. 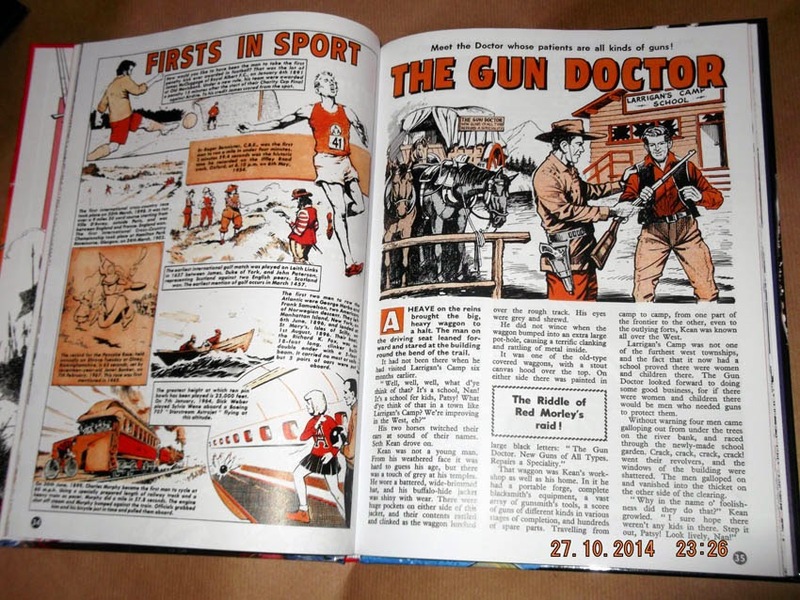 The strips originally appeared in Lone Star magazines and annuals in 1958/59 in black and white. For this collection, artist John Ridgway has carefully restored and 'colourised' them. More than a simple case of colouring, John has breathed new life into the strips. The results are very impressive indeed. The book also contains a three page interview with Ron Turner regarding his work on Space Ace, and a two page letters column. This is marvellous stuff. The plots and hardware may seem somewhat dated perhaps but that's irrelevant to collectors and enthusiasts of Ron Turner's artwork. In fact it's part of the attraction of such material. We really need more old strips archived like this before they're forgotten forever. 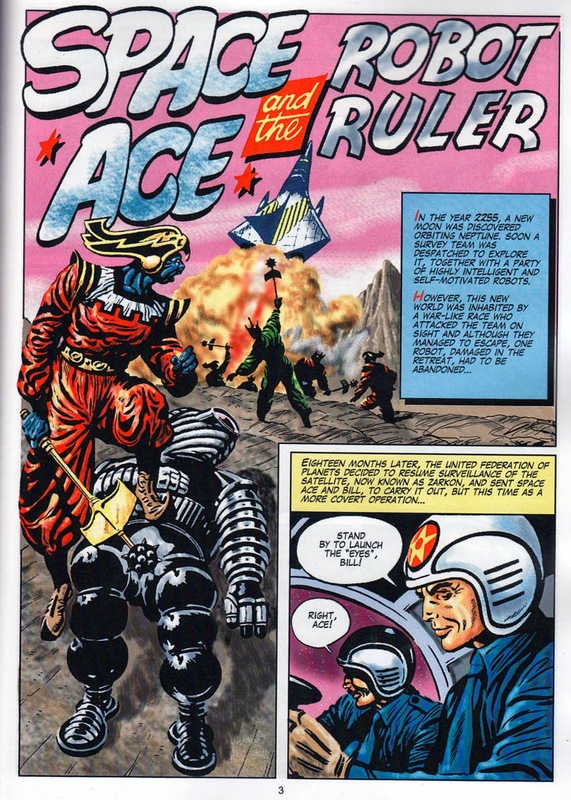 Ron Turner's Space Ace is a labour of love for John Lawrence. Although the price may seem slightly expensive it has to be remembered that the print run is very limited and that this is a non-profit venture. The printing and paper quality is excellent and its sturdy laminated cover makes the book look very classy indeed. 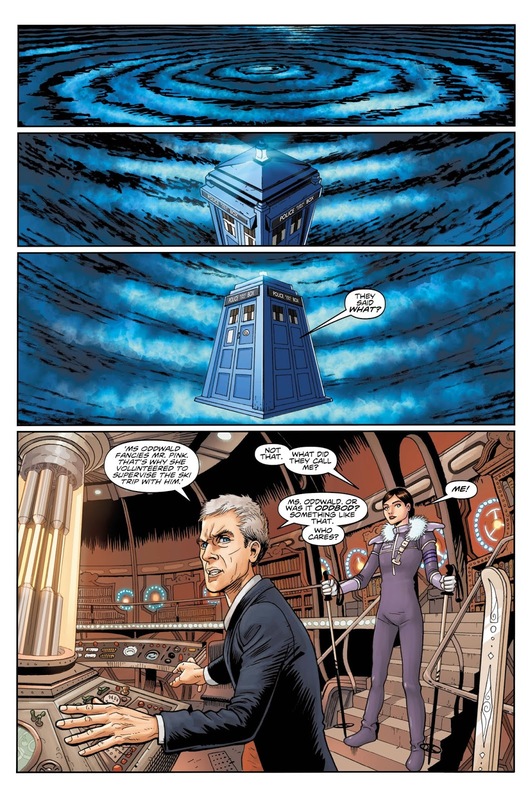 Titan Comics have today launched the first issue of Doctor Who: The Twelfth Doctor. This is a new companion title to their recently published Doctor Who: The Tenth Doctor and Doctor Who: The Eleventh Doctor ongoing comics. 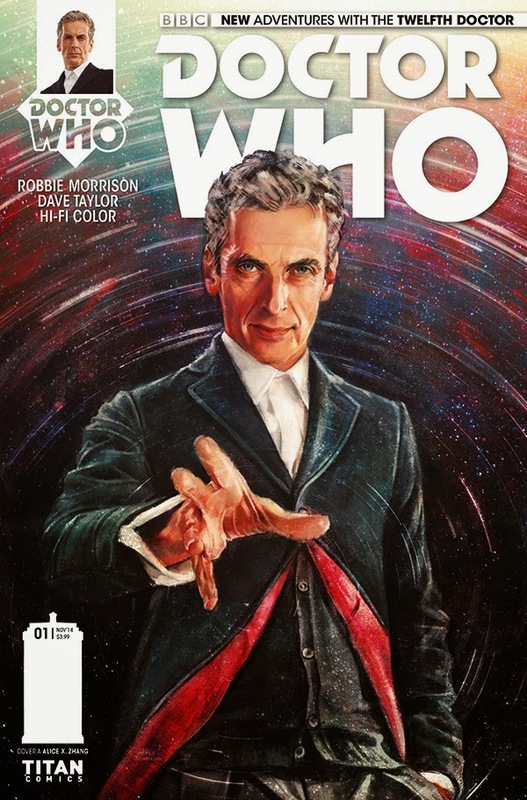 Written by Robbie Morrison (Nikolai Dante, White Death) and with stunning artwork by Dave Taylor (Judge Dredd), Doctor Who: The Twelfth Doctor is in the standard format of American comics and on sale in comic speciality shops (not newsagents or supermarkets). DON’T MISS THE STUNNING DEBUT OF THE TWELFTH DOCTOR’S ALL-NEW COMICS ADVENTURES! Freshly regenerated and with a new head full of unanswered questions, the Doctor (as played by Peter Capaldi) whisks Clara Oswald (as played by Jenna Coleman) away to a strange and distant world. Clara thought she was in for an evening of marking essays on the Metaphysical Poets, followed by going out on a date – or at least trying to. You know, normal stuff. Instead, she’s facing down exotic flora and fauna in her best dress, backing up the Doctor on a trek through traumatically alien undergrowth – and she doesn’t even know what the Doctor is searching for, or what will try to kill them should they find it! Whizzer and Chips returns... if you're lucky!